“Excelent apple juice! It’s been a long time since I encountered any this good.” It all began a couple of months ago, when I bought a bottle of apple juice at the Montecampana Farm, an organic farm located a few km from Nazzano Romano, where I regularly purchase organic foods from the farms in northen Lazio. One day my eye fell on a bottle whose label said, “Podere Fontecornino – Biologico in Toscana dal 1992”. Nothing strange, until I discovered that the farm belongs to Martin e Michael Gschleier, father and son from the Alto Adige. My brain, which isn’t as sharp as it once was, manages to activate some of the few remaining neurons I have, and Bingo! I remember Chiara Barioffi, the first-rate winemaker of Le Casalte at Montepulciano. Why? Simple: because it was she who showed me orchards under her property, and told me about a guy from the Alto Adige who had moved to Montepulciano more than 20 years ago to grow organic apples. Couldn’t be a coincidence; how many apple growers from the Alto Adige can there be in Montepulciano? One. 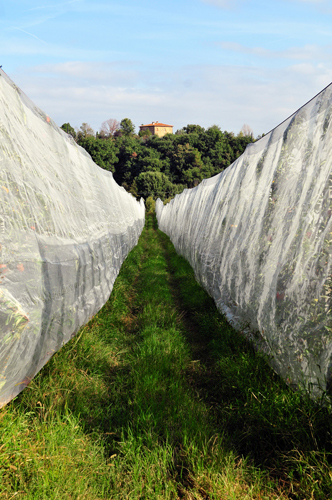 Good; since the apple juice literally bewitched me, I couldn’t resist and yesterday I visited the Podere Fontecornino, arriving at 9 AM as we agreed upon – I like to make good impressions – and was greeted by Michael, who was welcoming and also curious about why I was visiting. He told me of his father, Martin, who already grew apples and other crops in the Alto Adige, and in 1992 “descended” to Tuscany, where he found an area he held perfect for organic fruit farming. It takes a lot of work, however, beginning with the land; the conventional farm he bought stressed him, as it was invaded by weeds, compressed by tractors, and lacking the minerals and microelements necessary to feed fruit trees. He began the conversion; 11 hectares (about 26 acres) to be tilled and planted with alfalfa and clover, organic fertilizers, two-year old plants furnished by proven nurseries. In 1995 Michael arrived and work proceeded apace; they initially produced a variety of fruit: apples, kiwis, cherries (Chiara tells me they were wonderful) and then for organizational reasons decided to concentrate on apples, which they had been working with since the 70s. A dozen varieties: Gala, Gold Rush, Braeburn, Jonagold, Topaz, Stayman, Delorina, Fuji, Pilot, Pinova, Granny Smith and Summerred. The apples are sold fresh, or dried, and as juice. 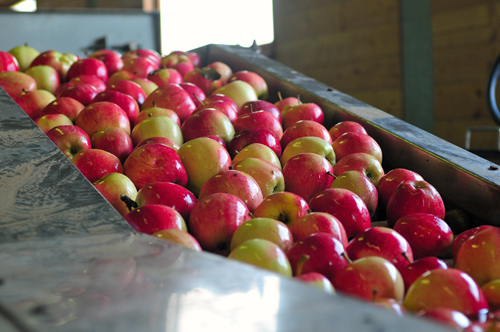 Some are used to make sparkling cider and vinegar, which are made by a concern in the Alto Adige. When Martin decided to buy the land, he knew that it hosts a number of crystalline springs, which he has recently redirected to a reservoir next to the orchards, and excellent source of water for times of need. In addition, a photovoltaic plant supplies the farm with almost all of its energy. 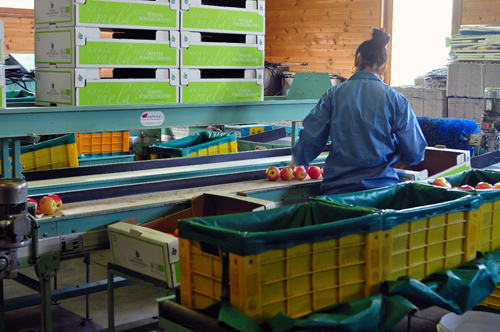 In 2004 he added the equipment necessary for selecting the apples and transforming them into juice and vinegar. 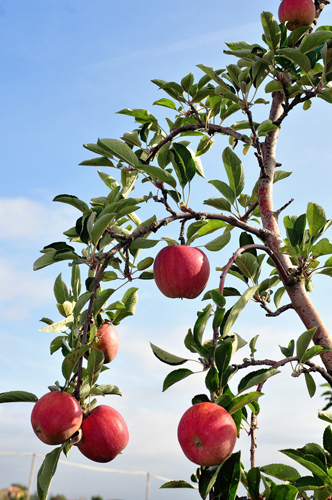 The goal for apple production is about 35 tons per hectare, which will be reached when all the trees are mature. 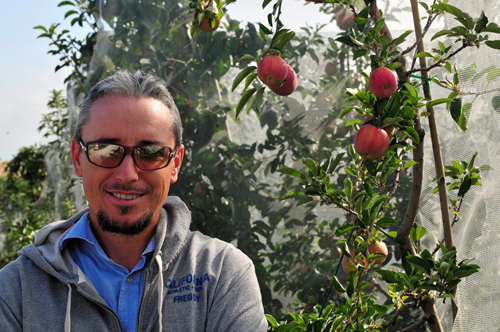 Michael says that at first they were unable to sell their apples in the Alto Adige, because nobody believed it was possible to grow apples of sufficient quality in Tuscany. Now much of their crop instead goes to the Alto Adige, and this says a great deal about the quality levels they have reached. Apple juice is one of my earliest and happiest memories, and in the Alto Adige I have often gorged upon it, given that it is a classic product – many small producers around Bolzano make it – but this is my favorite. Michael showed me the equipment and the process of selection and pressing; the juice from the apples (a liter of jiuce requires about 1.6 kilos of apples) is unfiltered, but rather worked with machines that reduce the diameter of the particles in suspension; in this manner the cider maintains its flavors and a good degree of transparency. The formation of a thin layer of sediment on the bottom of the bottle is normal, and I suggest you shake the bottle to resuspend it, as it contributes to the cider’s complexity and flavor. This juice’s strong point is the extraordinary balance between sweetness and acidity that comes thanks to the mixture of apples employed, which yields a nutricious 100% organic juice. Persistent, thirst quenching, fresh, and must be tried! 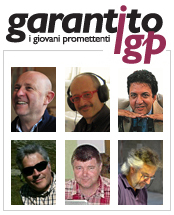 This entry was posted in Garantito IGP and tagged Apple cider, Apple Juice, Garantito IGP, Organic cider, Organic farming, Podere Fontecornino, Roberto Giuliani, Tuscan apples. Bookmark the permalink.